Xiao Wen Ju is an up-and-coming Chinese model who’s gaining fame in the global fashion scene. Now, she’s strutting her stuff in the Victoria’s Secret Fashion Week 2016. Xiao Wen Ju came is taking the fashion world by storm. She was featured in numerous fashion magazines like Vogue and walked for major fashion brands like Louis Vuitton and Prada. She then became the first Chinese model to be the face of a Marc Jacobs campaign. Now Ju’s the latest inductee into the elite class of supermodels lucky to call themselves a Victoria’s Secret Angel. Check out these hot pics of Xiao Wen Ju. #1. Xiao Wen Ju and Luma Grothe joined Karlie Kloss, Soo Joo Park, and Lara Stone at the L’Oreal Paris Blue Obsession Party during the 69th Cannes Film Festival in May. #2. 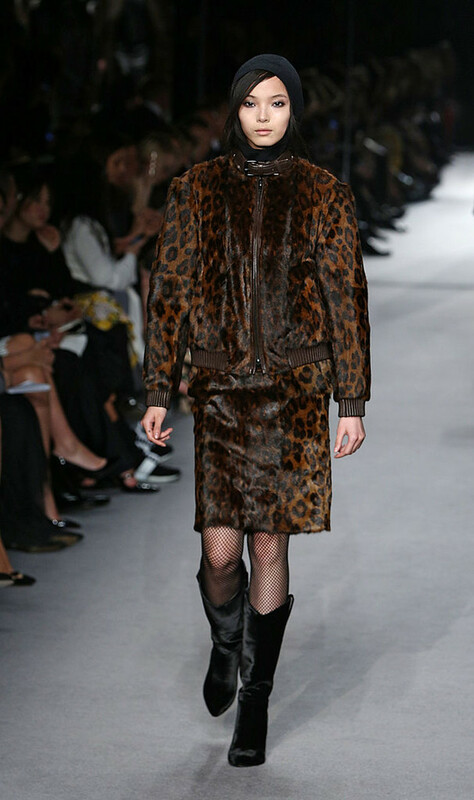 Ju showcased an animal-print creation from Tom Ford’s 2014 Fall collection at the London Fashion Week. #3. Ju’s natural beauty shone as she strut on the runway of NYX Cosmetics at the Yigal Azrouel Spring Fashion Show. #4. The Chinese supermodel showed she’s working hard for Victoria’s Secret show with her #trainlikeanangel post on Instagram. #5. Ju always says she has really dry lips. But we don’t know what she’s talking about! #6. Xiao Wen Ju proves that even in black and white, she’s an artist’s dream come true. #7. Ju looks like a graceful, classic actress in this old French cinematic-style pictorial at Cannes. #8. Ju seems to be a favorite of 3.1 Philim Lim brand designer, Philip Lim. He’s sometimes her date to events, and has cast her in several of his shows. My TENTH @31philliplim show ! THANK YOU @therealphilliplim #therealphilliplim ❤???????????????????????????????????????????????? #9. The model helped promote Ben Stiller’s Zoolander 2 looking like she can break into the acting world too. #10. Xiao Wen Ju can pull off anything. Even blue roses in her hair! #flowersday ???? #vogueus @voguemagazine by @willyvanderperre Style by @tabithasimmons Makeup by @lucia_pieroni Hair by @juliendys ??? ?